Oh, it is Digital Scrapbooking Day (DSD) in digital scrapbooking land! Visit digiscrapping sites to get a huge fixing of DSD goodness, there are many links in this page, but not all may have goodies up okay. A good place to start though would be the Sunshine Blog for their Halloween Blog Train. Last night, I logged on thinking of posting about the Halloween Party we had for the kids in this compound (plus some of their friends). But no matter how much fun we had at the party – both kids and adults alike – the fun isn’t what’s foremost in my mind to blog about. Scrapbook Saturday #11: No Pictures! I scrapped a page! Yay!!! Click on the photo for a larger view and the credits. Now, though there are a thousand and one words that I would like to write, let me take time to visit the rest of the Scrapbook Saturday gang (a day late, as usual!). Thank you so much for your comments on my UP100 layout. I realized I didn’t post the story behind the photo and the layout, so here goes. When we first walked the streets of Diliman as freshmen students, and gone up the steps of Palma Hall and its Annex – our beloved PHAn – the University of the Philippines was just celebrating it’s 90th foundation anniversary. Now, it’s Centennial year. Because our paths crossed in UP, the UP will always be part of us when we celebrate our friendship. There’s seven of us in the group but only three in that picture: Arianne, Yrish and Mayeen. This Centennial year, there are a lot of ways that the UP community is celebrating – this includes the release of memorabilias. And what are UP girls to do with all those collectables? Why, grab ’em of course! 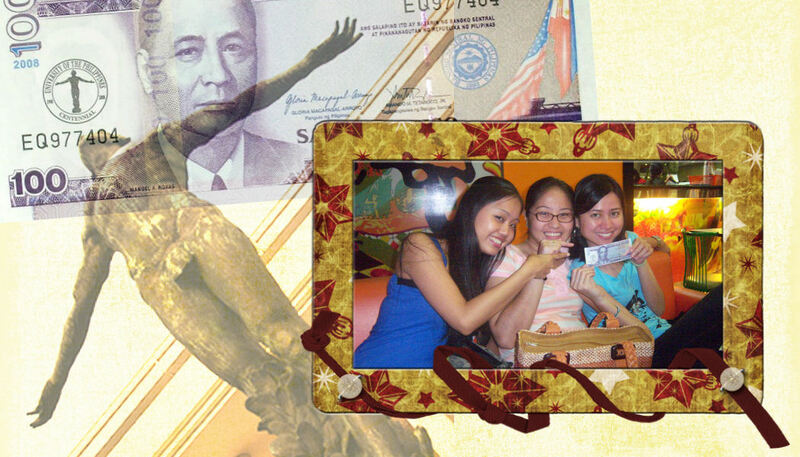 That’s Mayeen showing the rest of us her piece of the limited edition hundred peso notes that were released this week. I have one myself but I don’t bring it with me anymore. I used to have two crumpled pieces in my purse but I accidentally gave one to a taxi driver when I was paying in a hurry. When I got a better looking piece, I parted with the last crumpled one. Haha. Scrapbook Saturday #10 – UP Siglo! This will go into the same album that I’ve been working on-and-off on for a month now. I can’t wait to finish it so I can move on to the next project(s). Credits: Background by MGL Scraps for Love Actually; Silvia Cluster Frame by KimB. Oblation photo by user m_a_r_k_y at Flickr. And Centennial 100 peso bill photo from PhilMoney. Visit other Scrapbook Saturday participants by checking out the SS HQ through the logo, or you may start off by checking out MammaDawg’s halloween pages. Reasons to be happy – friendship and new tower! I endured not having the use of my desktop PC for several days, and I am now rewarded with a much faster and reliable system! 1. Everyday Life 2. Words of Love 3. Sheng’s Simple Thoughts 4. Me and My World 5.Real Expectation 6. Muthahood Crib 7. Verabear 8. Add yours here! I, and the rest of the family, Alfred included, are looking forward to our new fitness equipments. Okay, I haven’t actually confirmed if my parents made the purchase, but my dad is suddenly motivated to exercise. We’ve had this treadmill for years but it mostly just gathers dust, until my dad started using it again daily since last week. The treadmill was also my equipment of choice when I used to go to the gym. The ones there are electronic, and were more comfortable for me to use than the one we have here at home. If dad is getting a stationary bike though, there’s something I would definitely make time to use. My favorite part of his body is still his chest and all the way to the shoulders, because of the way I feel so comfortable just snuggled there. I don’t really want that to become rock solid, but lifting weights might just give him the build that I know he wants too.